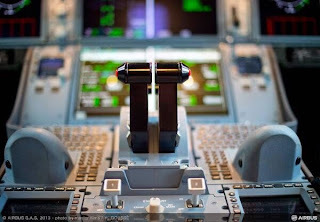 A350 XWB News: A350 pilots first surprise; quiet, dark cockpit design. Each color has its meaning. A350 pilots first surprise; quiet, dark cockpit design. Each color has its meaning. Aviation Week & Space Technology had the opportunity to fly the A350. In the report published it was highlighted that several differences are apparent, between the new Airbus and Boeing widebody twins and between the A350 and earlier A330. If something does not require attention, it is not shown and not heard. 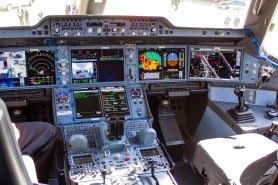 The A350 has the largest displays in an Airbus: 6 Thales 15-in. landscape flat panels. 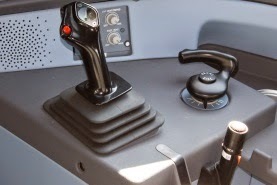 ·In front of each pilot is the primary flight and navigation display (PFD/ND). ·The top center screen is the electronic centralized aircraft monitor (ECAM) with engine instruments, system display, mailbox and crew-alerting annunciations. 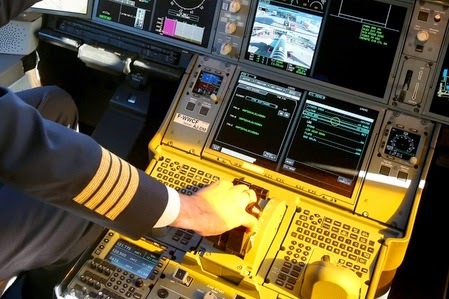 ·The bottom center screen presents twin multifunction displays, used for flight planning via a point-and-click interface. Based on the article “Balanced Performer” published in Aviation Week.